FREE SUMMER FUN AT HEIFER VILLAGE! 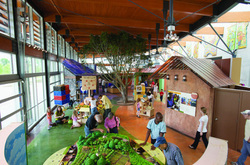 All summer, Heifer Village will host “Heifer Hour” on Tuesdays and Saturdays for kids and their parents. The event, geared toward grades K-5, feature crafts, games, children’s books, outdoor activities and more to teach kids about caring for the Earth and others. All materials will be provided by Heifer. Heifer Hour is at 11 a.m. on Tuesdays and Saturdays until August 31. All activities are FREE. All books listed are available for purchase. The Cabot School District will be offering a free SAFE (Safe Activities for Everyone) physical activity program for children and adults. District physical education teachers will open the gymnasiums at Central Elementary and Ward Central Elementary on Mondays, Wednesdays, and Thursdays, from 10 am until 11 am. Children will be lead through physical activities and will learn about injury prevention and safe outdoor play. Adults will be able to check out pedometers and walk/run around the campus. Pedometers will help adults track distance completed. The program will begin June 10th and end July 18th (No physical activity class on July 4th). This opportunity is open to the community as part of the Summer Feeding Program.